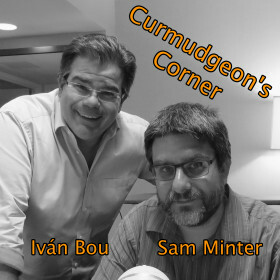 This week on Curmudgeon’s Corner, Sam and Ivan talk about the Baseball shooting in Virginia and the related issues about the tone of our political discourse these days. Of course they can’t forget the Trump scandal developments of the week too. In between they squeeze in some talk about healthcare, Puerto Rican statehood, the great butter shortage, and a few other things. But most importantly, a very rare but special gift from Ivan. Tune in to hear what it is! But first at the but end? After the Virgin Islands, Clinton only needed 9.26% of the remaining delegates to win. Sanders needed 90.96% of the remaining delegates. In Puerto Rico, Clinton got 36 delegates, Sanders got 24. Since the Virgin Islands, 6 more superdelegates were added to Clinton’s count as well. So total change since the Virgin Islands: Clinton +42, Sanders +24. That is Clinton 63.64%, Sanders 36.26%. So Clinton met her target, Sanders did not. New delegate totals: Clinton 2340, Sanders 1572, O’Malley 1. There are 852 delegates left. Clinton needs 43 of them. Sanders needs 811 of them. 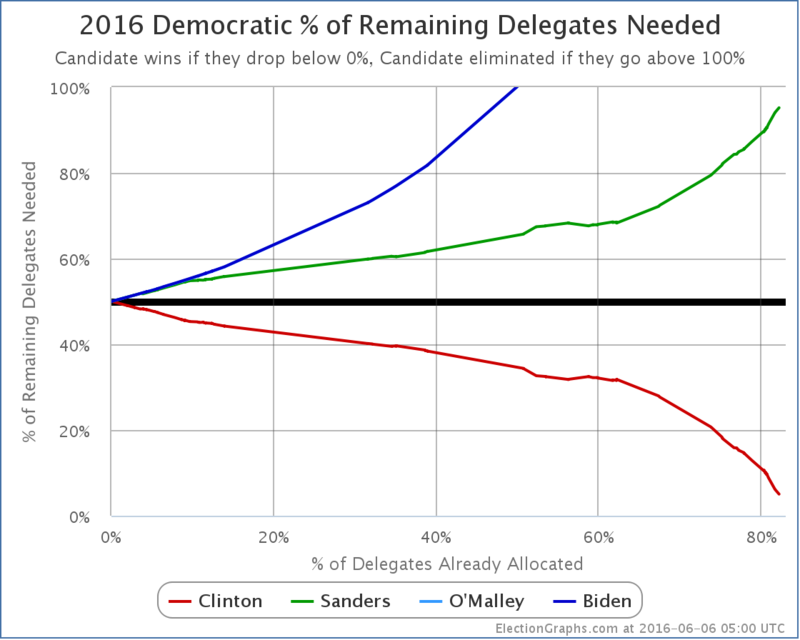 Clinton now needs 5.05% of the remaining delegates to win. Sanders needs 95.19%. This of course includes superdelegates. Please see any number of previous posts here on Election Graphs as to why it is appropriate to include them, even though they can change their minds until they vote at the convention. If any superdelegates change their minds publicly before then, it will be tracked here. Right now Clinton only needs 43 more delegates to clinch the nomination. There are still about 139 who have not stated a preference. There have been media reports that Clinton has 40+ superdelegates who have privately committed to her that they are waiting to roll out after the New Jersey results almost certainly push her over 2383 anyway. NBC, AP and some others also have a higher current delegate count than I do for Clinton by about 20 delegates due to information they have collected privately from superdelegates. 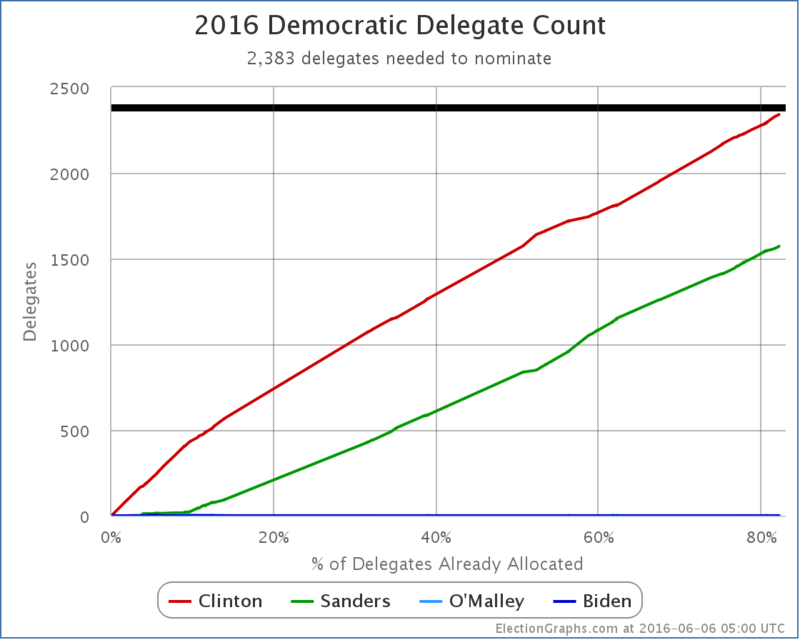 Put all of that together, and it is actually very possible, indeed probably very likely, that Clinton ALREADY has more than 2383 delegates that she is sure of. In terms of public confirmation, she is just a few handfuls of delegates away, the number of handfuls depending on whose delegate count you go by. Superdelegates could give Clinton the nomination at any moment now. But since Clinton would prefer to win after the votes of regular citizens are counted, her campaign is almost certainly asking any currently uncommitted superdelegates leaning toward her to wait. So with as much certainty as you can ever get in these sorts of things, expect Clinton to be declared the presumptive nominee by everybody who does such things shortly after the polls start closing on June 7th. For this site, the blog post about the June 7th results probably won’t go out until the next morning, but watch @ElectionGraphs on Twitter for hourly updates of the delegate totals, including of course noting when she wins the nomination by our own count. Update 2016-06-07 22:31 UTC: My source trying to catch up with superdelegate info resulting from AP’s updated counts. Net Change: Clinton +15, Sanders +1, O’Malley -1. Yes, that one O’Malley superdelegate finally flipped… to Clinton. Update 2016-06-07 23:55 UTC: Updated the number of superdelegates in a bunch of states as per Green Papers. Most changes were uncommitted slots anyway, but there was a net change of Clinton -1. There was no net change to the total number of delegates. Edit 17:40 to fix a typo where I said Clinton needed 42 delegates instead of 43 in one of the places it is mentioned. Rubio walked away with 71% of the vote in Puerto Rico. Anything more than 50% meant that he got 100% of Puerto Rico’s 23 delegates. In addition, some of the TBD delegates in Louisiana were determined since the post about the March 5th results. Rubio picked up 5 delegates while Cruz picked up 1. There are still 5 more delegates TBD from Louisiana. It looks like Louisiana’s rules state these should be officially uncommitted delegates, but the national rules don’t allow that this year, so… we’ll see what happens. Anyway, that means since the last update, Rubio got 28 of 29 delegates… 96.55%! He had needed only 69.50% to be on track to catch up and win outright! Uh, of course, nobody expects Rubio to continue at this pace in the next few states. You see that dip downward for Rubio? He does actually improve this time around. Now he only needs 68.94% of the remaining delegates to catch up and win! That still seems unlikely given he only has 17.09% of the delegates so far, but at least he went in the right direction for once. In the mean time, everybody else’s position got worse. Specifically, Trump moved from needing 52.88% of the remaining delegates to needing 53.85%. For each contest where he fails to reach his needed percentage, the bar for the remaining contests gets higher. The current delegate totals are: Trump 391, Cruz 304, Rubio 154, Kasich 37… and 15 for people who have dropped out. 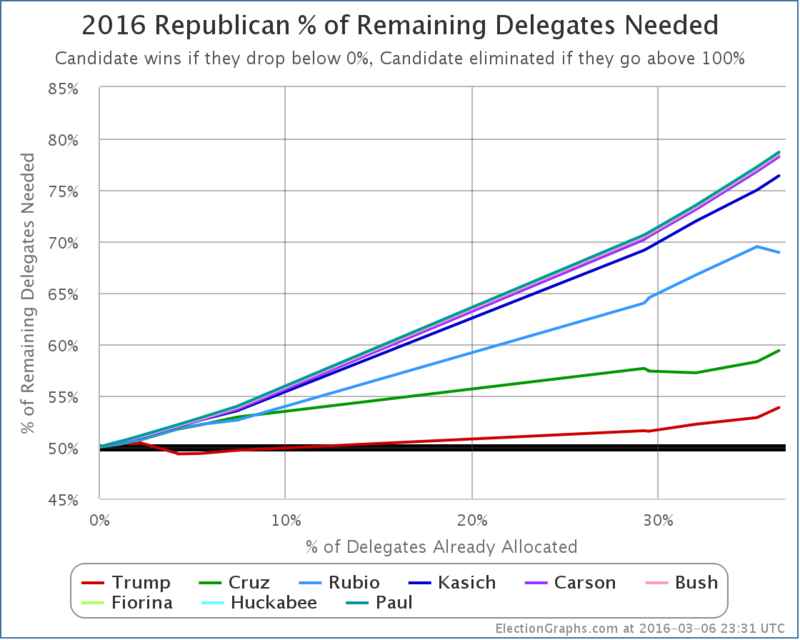 With these projections, Trump would get 60.67% of the delegates on March 8th. That would be more than the 53.85% of the delegates he would need to improve his position. The new totals would be: Trump 482, Cruz 332, Rubio 172, Kasich 49… and 16 for people who have dropped out. Doing the rest of the math, that is a total of 1051 delegates. 1421 delegates would still be available. Trump would need 755 more delegates to win outright, which would be 53.13% of the remaining delegates. So Trump would have improved his position, but not by very much. The above assumes that the current polls hold of course. The results this weekend may indicate that Trump has been weakened by the events of the last week. If so, he may significantly underperform these estimates, putting him in a worse position. So these may be estimates that are optimistic for Trump. And that still keeps us in the contested convention zone. For now. Trump’s big chance to break out of that won’t come until March 15th with Florida and Ohio’s 165 winner take all delegates. Until then, watch to see if Trump is able to match his 53.85% target line on Tuesday. Update 2016-03-09 03:32 UTC – Update to get ready for tonight’s results. New Oklahoma estimates add one delegate for Cruz, subtract one from Trump. This does not significantly change the analysis above.